Another Deborah original recipe for your enjoyment. Remember, as with most of my recipes, all measurements are approximate and to your own personal taste. I did not measure anything as I went–I’m telling you approximately what I used as I eyeballed it! Enjoy your time in the kitchen, and everywhere else! 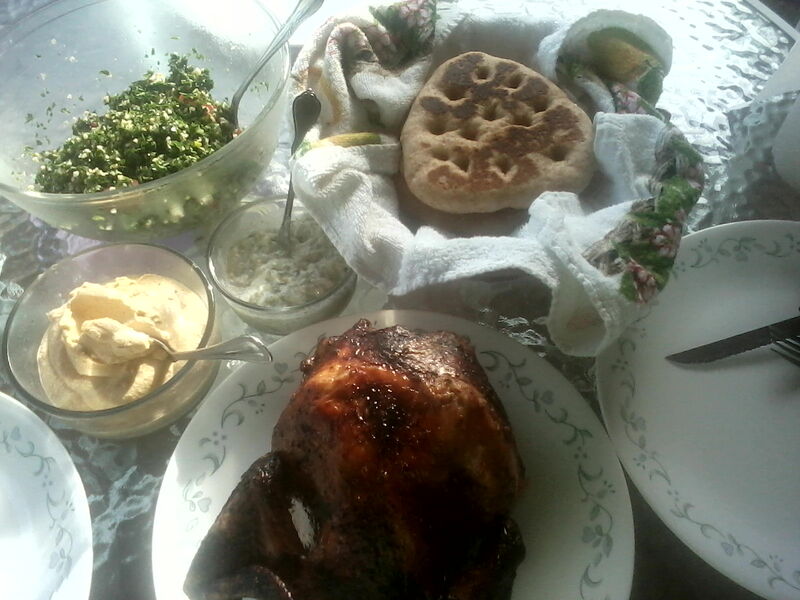 Our little chicken, served with tabouli, hummus, tzatziki, and bread for dipping. I don’t know what kind of bread it is. I made it up. If asked, I’ll post the super-simple instructions. I started with a little 3.75# spring chicken that I got from Working-H Farms at the Morgantown Farmer’s Market. Helpful hint: whisk in the lemon juice little by little so you don’t have a ball of butter flying around your bowl!Ask me how I know … anyway, after I had it all emulsified, I spread that on a small plate and refrigerated, then after it had solidified, I stuffed pieces of it under the skin all over the chicken. I warmed it over low heat to just melted and used that to baste Mr. Chicken a few times after the first hour of his rotisserie journey just for the heck of it. Result? Just enough flavor to enhance, not overpower, that fresh young chicken flavor. Score! 🙂 If you try it, let me know how it worked for you! You can leave comments by clicking here, leave a trackback at http://anotherchanceacres.com/greek-inspired-rotisserie-chicken/trackback/ or subscribe to the RSS Comments Feed for this post. It sounds delicious I must say, I love rotisserie chicken though I can’t remember when I last made one. This must have tasted delicious, because it looks delicious too. I wish you all the best in setting up “the homestead’ and I hope your blog will turn out into a great one. Look forward to seeing more of your posts. Have a lovely weekend! !